• Chrissie is tied with Serena Williams for the all-time record for most US Open singles titles, winning 6 total. She won 6 of 8 US Opens between 1975 and 1982, the only female player to win that title on 2 playing surfaces: clay and hard court. At one point, she won a string of 4 US Open singles titles in a row, which is a record streak. She also holds the record for most career singles victories at the US Open, with a total of 101. • Evert holds the record for most French Open singles titles, winning 7 total. This is all the more impressive when one considers that she did not even play in this clay court Grand Slam event in 1976, 77, or 78 (due to her commitments to World Team Tennis, in a successful effort to greatly raise the pay of professional women players) when she was both #1 in the world and undefeated on clay, considered unbeatable at the time on that surface. • Evert won a record 125 consecutive matches on a single surface, clay, spanning a near 6-year period between August 1973 and May 1979; doubly impressive as this accomplishment was achieved during the wood racquet era, when a bad day could not be masked by larger sweet spots and compensated for by racquet-generated speed. Wood racquets reveal any mis-hit or lapse in concentration, unlike today. Even so, it is hard to imagine that this string will ever be broken, either in the amount of consecutive wins or in the amount of years without a loss on a single surface. When she was finally beaten, it was in a third-set tiebreak, with the score 6-4 2-6 7-6 in the semifinals of the Italian Open against Tracy Austin. Perhaps more remarkable still, Evert then followed up that all-time streak with the second longest winning streak on clay by any man or women in the Open Era, winning another 64 matches straight. She didn’t lose again until the ’81 French Open, for a staggering 189-1 match record on clay surface court. This 2nd record held firm until Rafael Nadal won 81 in a row in 2007! Chris still has the top 2 longest streaks of the women players however. • Evert won a record 157 Tournament Singles Titles after her 286th event. When Martina Navratilova matched her record, it was after Navratilova’s 343rd event. She is currently second to Navratilova, who topped out at 167 titles. • Evert won 300 Grand Slam singles matches, presently third all-time behind Serena Williams (309 & ongoing) and Navratilova (306). Worth noting: Chrissie skipped 10 Slams in her prime; 7 at the Australian Open (1975-1980, 1987) where she never failed to reach the final or better in all her appearances there, and 3 at the French Open (1976-1978) where she is considered the Greatest French Open Champion in women’s tennis history. That equates to 70 unplayed matches, most of which while she was #1 in the world. • Evert won more than half of the tournaments she entered throughout her 20 year career, made the finals in 76% of them, and made at least the semifinals in 90% of all the events she entered. • In April 1985, Evert was named Greatest Woman Athlete of the Last 25 Years by the Women’s Sports Foundation. Evert regained the #1 ranking a month later after her exquisite French Open title victory over Navratilova, a ranking she held until November of that year. The Queen was back on the throne for one last time. • Evert’s 18 Grand Slam singles titles tie her for fifth all-time, appropriately, with Martina Navratilova. They are behind Margaret Court (24), Steffi Graf (22), Serena Williams (22) and Helen Wills Moody (19). It should be highlighted that Evert and Navratilova are the only ones in this category that had a fellow all-time great competing for those titles at the same time; Chris won 18 but lost in 10 more Slam finals to Martina. And as previously mentioned, she skipped another 10 Slam events in her prime, with 7 at the Australian Open and 3 at Roland Garros. Those 3 French Opens were sacrificed in order to bolster support for higher prize money and professional stature for the WTA, by playing Billie Jean King’s spearheaded World Team Tennis; a worthwhile sacrifice to ensure a bright future for women’s tennis. 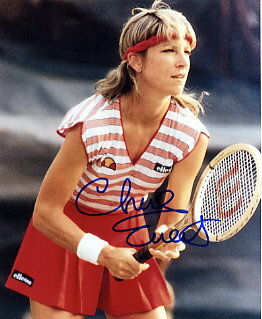 • From 1972 to her retirement in 1989, Evert was never ranked lower than fourth in the world for any given ranking week. It’s also quite an accomplishment to mention that Evert was never ranked lower than either #1 or #2 during the entire years span of 1974 through 1986 in the year-end rankings. • Evert closed her pro career by winning all 5 singles matches, at age 34, en route to a U.S victory in the World Federation Cup in 1989. It was her ninth year and 8th Cup-winning team. She was also undefeated in career Wightman Cup singles (26-0), helping the U.S. to win 11 Cups in the 13 years she played. 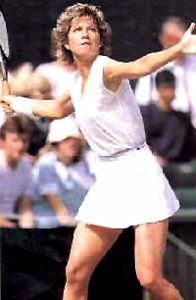 • Evert was the first player to win more than 1,000 singles matches as well as 150 tournaments, first woman to reach the $1 million dollar mark in prize money, and the only one other than Margaret Court or Billie Jean King to win more than 100 matches in a season, which she did during a mammoth 1974 when she won 16 of 24 tournaments on a 103-7 record. Her 55-match winning streak in 1974 remained an open-era record for 10 years. • Chris also understood her responsibilities to the sport off-the-court. She was the WTA President in 1975-76 and 1983-91. • Evert’s .900 winning percentage (1,309-146) is the best in pro tennis history, male or female.